Coconut Oil: Does it Really Have Health Benefits? Coconut oil is being touted as the magic cure for everything from eczema to obesity. 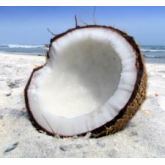 The oil, scientific name cocos nucifera, comes from the meat of the coconut. It’s a saturated fat, but proponents claim that it’s an unusual, and healthful, saturated fat. The virgin, unadulterated form of the oil is said to be more beneficial, as processing alters the molecular structure. Fats have a variety of molecular structures. Some saturated fats like lard and butter have a long chain fatty acids Coconut oil has a medium chain fatty acid; one that is easier to digest and not as readily stored as adipose (fat). A 2011 Malaysian study (authored by Kai Ming Liau, Yeong Yeh Lee, Chee Keong Chen, and Aida Hanum G. Rasool) analyzed the effect of coconut oil on weight loss. This study looked at 20 overweight Malays. The researchers observed a 2.86 cm waist reduction in males. There was no significant waist reduction in females. Both males and females showed an unchanged lipid (cholesterol) panel. The unchanged lipid panel is noteworthy as coconut oil proponents point to the low levels of cardiovascular disease in Pacific Islander and Indian populations as proof of coconut oil’s efficacy. However, as Dr Mehmt Oz suggests, lower cardiovascular problems could be linked to the more plant based diet. While interesting, doctors encourage more study. Ms Gordan quotes Dr. Daniel Rauch, director of the pediatric hospitalist program at New York University’s Langone Medical Center, “This is a very interesting but small study. The jury’s still out as to whether there’s a real benefit here.” The improvements here may be due to lauric acid, a component of coconut oil. Early research indicates that lauric acid has antifungal and antiviral properties. Wellness Times writer Karolyn A. Gazella notes that mainstream practitioners tend to be skeptical of coconut oil. Mayo Clinic dietitian, Katherine Zeratsky stresses the adverse impact of saturated fats. She warns that while “eating coconut oil in moderation “isn’t likely to harm your health, it’s not likely to help you lose weight either.” She proposes a combination of healthy eating and exercise for long term health and weight loss. In India, coconut oil has been used as a beauty aid for thousands of years. In this instance, it comes in a jar and iss applied to hair and skin. It’s recommended that a patch test be done before initial use. A small amount can be smoothed on the arm or leg to check for allergic reaction. As for internal use, coconut oil needs more scientific study before definitive recommendations can be made. For now, moderation, not magic, applies. I started using coconut oil. Shold i eat a teaspoon a day? you know, I have been eating about that. I figure a little won’t hurt me. 🙂 It IS a great skin moisturizer for body nor face. It’s too greasy for my face.